Fall is a favorite season of mine and probably a favorite season to many of you. It’s also the time of year that my favorite honeycrisp apples are available. Like cotton candy grapes, these apples benefit from scarcity. 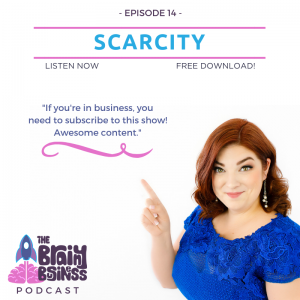 Today, I break down what scarcity is and how you can apply this concept to your business. Scarcity is another concept in my lessons on behavioral economics foundations. Traditionally, scarcity is when an item is limited, but there is unlimited desire for that item. When we see something as scarce, we perceive that it has higher value. In today’s behavioral economics podcast, I will share stories and examples of how scarcity affects perceived value and how it relates with other foundational concepts like loss aversion. [02:27] I love the fall, baking, and apple season. [03:12] My favorite apples, honeycrisp, are only available around certain times of the year. These apples have the benefit of scarcity, and that is what this episode is all about. [03:36] In today’s episode, I break down what scarcity is and what happens in our brain when we perceive that something is scarce. I also give a lot of examples on how to implement this tactic in a business like yours. [06:00] Scarcity occurs when an item has limited availability, but unlimited demand. This includes resources like oil and water or more abstract resources like time. [06:22] We see things as more valuable when they are less readily available. [06:52] With a watch advertisement, people were actually willing to pay 50% more when they thought that the watch was scarce. [08:01] The most valuable stamp in the world, the British Guiana is valued at $11.5 million! [08:23] The first silver dollar printed and issued by the US government (called the flowing hair) sold for $10 million at auction. [09:32] Scarcity and value are closely tied together and for some reason our crazy brains think less is more. [09:38] Scarcity also triggers loss aversion. When something is scarce, we don’t want to miss out on the opportunity to get it. [10:48] Examples of big brands using scarcity that you can use to apply in your own business. [10:51] Costco: People stock up when shopping at Costco, because they know that the great deal they find won’t be there when they go back. Costco also has a great return policy to eliminate people’s fear of making these purchases. [13:01] Starbucks: Right now it is time for the pumpkin spice latte. A drink made famous by Starbucks. Scarce items take on a life of their own. @theRealPSL even has its own Twitter account. [15:19] Scarcity can create cult followings which means other people do the marketing for you. [17:45] From rose gold Starbucks tumblers to rose gold Minnie Mouse ears, scarcity encourages items to sell. [18:40] These examples are a combination of scarcity and availability which will be the topic of next week’s episode. [20:22] Real estate: Scarcity is implied. You can use words to trigger scarcity, such as limited time, extended, custom, handcrafted, one-of-a-kind, and close out. [21:21] There is value with holding firmly to specific hours. When you are booked you are booked. [21:52] When enforcing your hours, you need to say it with confidence. I talked about this in last week’s episode about mindset. [22:51] If you aren’t selling a product yourself, you can still you scarcity by putting on a contest. [24:07] The holidays are full of examples of scarcity. There are limited holiday treats, black Friday sales, and usually a big toy of the season. [25:26] When using scarcity think exclusivity instead of cheesy tactics. [25:50] Diamond engagement rings. Diamonds actually aren’t that rare, and large diamond engagement rings weren’t that popular until the 1940s. The concepts of scarcity and availability work together to make diamonds what they are today. [30:29] The diamond example is fascinating, and next week I will talk a lot more about it. Basically, they used scarcity to create perceived value. [32:49] You can book a strategy session with me for 10% off if you book by September 30. That 10% discount also applies to the workshop in Seattle on October 24. [34:08] I will be giving my Consumers Are Weird talk at the Arkansas Bankers Association Mega Conference in Little Rock next week – will you be there? [34:38] I will also be in Portland, Maine in a couple of weeks. Email melina@thebrainybusiness.com if you would like to connect.